In 2016, Spain is expected to see another improvement in business failures (10% decrease), but compared to 2008 levels, insolvencies remain high. Corporate defaults have closely reflected economic conditions, with high year-on-year increases seen in 2012 and 2013. This was mainly a consequence of the drop in internal demand and generally high pressure on businesses’ liquidity because of their limited options for external financing. 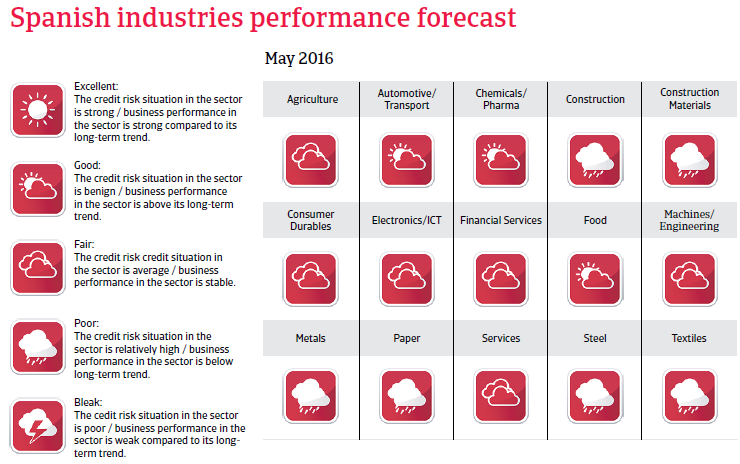 However, with the economic rebound since 2014 insolvencies started to fall again, and this positive trend is expected to continue, with business failures forecast to decrease 10% in 2016. 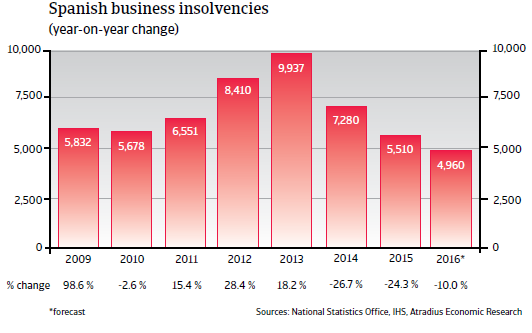 This would still leave business insolvencies at a high level of about 5,000 cases, not yet fully recovered from the increases since 2008, when about 3,000 cases were recorded. 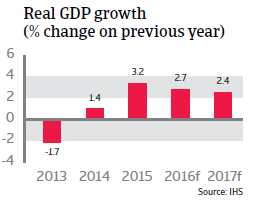 Spain’s economic rebound gained momentum in 2015, with GDP increasing by more than 3%. In 2016 economic growth of 2.7% is expected as household consumption remains robust and unemployment continues to decrease. Both real fixed investment and industrial production are expected to continue to grow and export growth to remain robust in 2016. 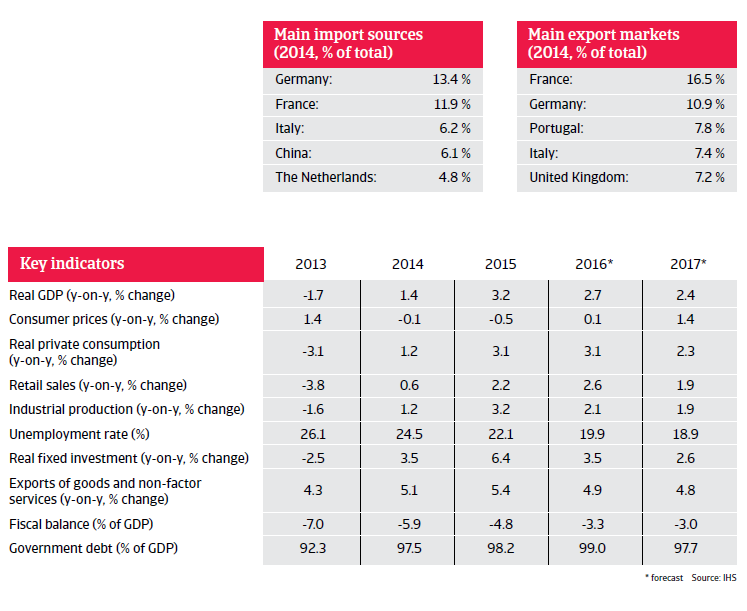 Spain’s international competitiveness is improving and its export sector is relatively healthy and competitive. 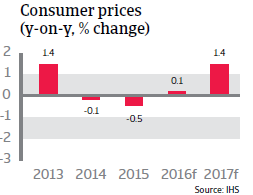 Spanish consumer prices decreased in 2014 and 2015, a worrying trend because, as prices fell, it became harder for Spanish debtors to service their debts fixed in nominal terms. Another issue is that deflation tends to suppress demand, as consumers have an incentive to delay purchases and consumption until prices fall further. However, the European Central Bank has repeatedly taken robust measures to avoid a vicious circle of deflation in the eurozone. Consumer prices are expected to increase again in 2016. Public debt is expected to peak at 99% of GDP in 2016 while the fiscal deficit is forecast to continue to decrease in the coming years. In 2016 a fiscal deficit of 3.3% is predicted, followed by a reduction to 3.0% of GDP in 2017. Two in five respondents in Spain expect payment practices of B2B customers in the consumer durables industry to deteriorate over the next 12 months. Since 2000, the Spanish chemicals sector has increased its exports by more than 170 %, demonstrating its competitive edge in the global market.